March Madness. In Minnesota, it has nothing to do with college basketball or spring training. It has everything to do with playoff hockey. Check out what’s happening around the State of Hockey during our favorite time of year. Only a few more weeks and a handful of games remain in NHL regular-season play. The Minnesota Wild is on the hunt for postseason hockey once again. But it’s a tough road ahead that includes bouts with Detroit (March 22), Pittsburgh (April 5), Boston (April 8), St. Louis (April 10) and Nashville (April 13). While those games should be circled on your calendar, be sure to check out the tilt against Vancouver on March 26. The matchup takes place on Youth Hockey Day, where all 2014 Minnesota Hockey State Champions will be honored. Follow the action and get tickets at Wild.com. A sheet of ice returns to the Target Center for the first time since 1999. The NCHC will hold its inaugural championship tournament March 21-22. Dubbed the Frozen Faceoff, the tournament will showcase the top four regular-season finishers from the eight-team league. As conference home to St. Cloud State University and the University of Minnesota-Duluth, fans of the old Western Collegiate Hockey Association will also have the potential of seeing familiar foes from North Dakota, Denver and Colorado College. A new set of teams will take the ice at Xcel Energy Center at the end of the month. The inaugural Big Ten Men’s Hockey Tournament will be held March 20-22. Minnesota, Wisconsin, Penn State, Michigan, Michigan State and Ohio State will duke it out in a single-elimination format for the automatic bid to the NCAA tournament. The Gophers won’t be the only team representing Minnesota. The tournament will also be a welcome home for Minnesota natives on opposing teams. A total of 15 make their return to the State of Hockey for the weekend. The women’s WCHA Final Face-Off will be held March 7-8 at Sanford Center in Bemidji. Wisconsin, North Dakota and the University of Minnesota-Duluth have all had strong seasons and will look to dethrone the Gophers at the conference tournament. Visit WCHA.com for ticket information. 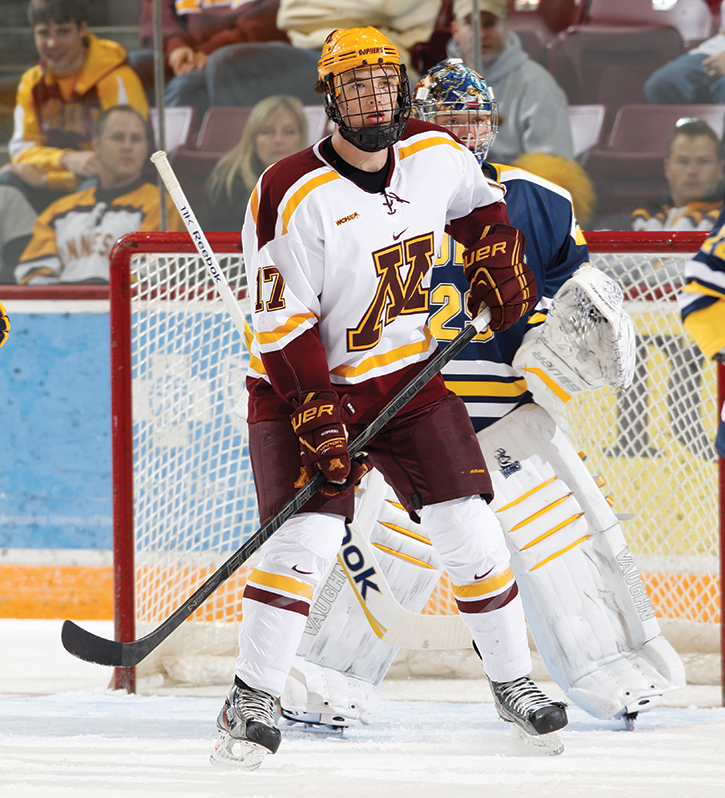 Even more college hockey action will be packed into the Twin Cities. The Xcel Energy Center will be the site of this year’s NCAA Men’s West Regional matchups. Teams will compete at 4:30 and 8 p.m. on March 29 with the winners advancing to the region finals at 6:30 p.m. on March 30. The region champion will head to Pittsburgh for the Frozen Four, which begins on April 12. The Division I women’s quest for the NCAA championship also begins this month with the Gophers aiming for their third-straight national title. Quarterfinals start March 14. Teams will meet in Hamden, Conn., for the Frozen Four on March 23. The Minnesota Wild and Blue Cross and Blue Shield of Minnesota will honor all Minnesota Hockey State Champions for the second year in a row. The Skate for State campaign will include a prominent exhibit at Xcel Energy Center that honors each state championship team while featuring former Wild players who participated in Minnesota Hockey State Tournaments. On top of that, the Wild will recognize all 2014 Minnesota Hockey State Champions on Youth Hockey Day, which will take place on March 26 when Minnesota faces off against Vancouver. Select members of each team will be on the ice to be recognized during the first intermission.